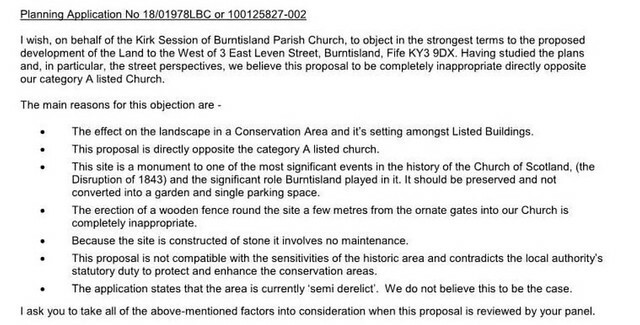 Since the last story on this proposal there have been 10 objections (including one from the Kirk Session – below) so that a decision about Listed Building Consent must be made by the Planning Committee, not council officers. Now there is a Planning Application which was submitted at the same time as LBC application. Initially the submission was incomplete and invalidated. The related LBC submission was complete and was validated – which is why it was made public, causing some confusion including suggestions that a Planning Application had already been approved. Further confusion was evident at last week’s Community Council when the Listed Building application was discussed again. At last month’s meeting the application was noted after very little discussion and no realisation that this would be a controversial proposal. Last week the merits of privatising this space and enclosing it with a high, solid, fence were discussed. 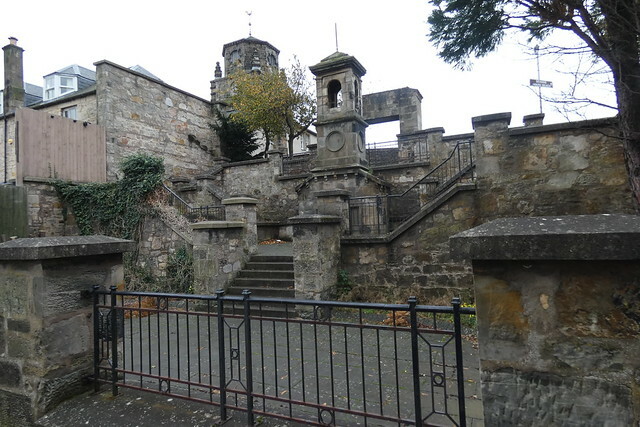 CC members were split between ‘it’s part of Burntisland’s heritage and should remain public’ and ‘it’s hardly ever used and attracts anti-social behaviour’. A member of the public who lives nearby said that ASB was “overstated”. Some Community Councillors added that any problems should be dealt with by the Police and other agencies, not the planning process. None of the CC members seemed to be aware that there is now a live planning application in addition to the listed building one. Both applications will be assessed together. Fife Council Estates have agreed to sell the land to the applicant subject to planning permission. It is assumed that the land has not been put on the open market. Objections need to be sent by Thursday 29th November 2018. It is likely that this will be going to the Planning Committee in January. 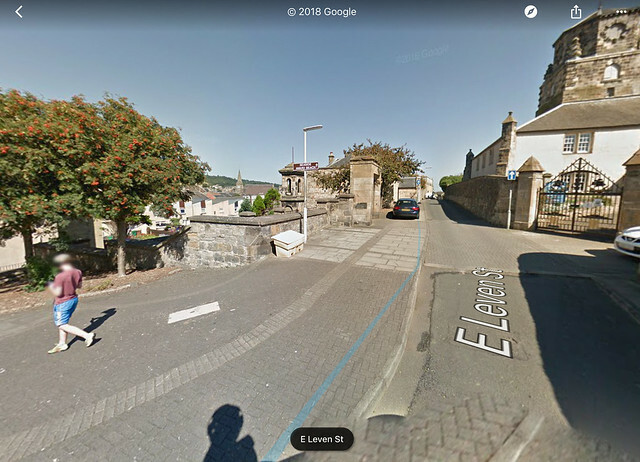 Perhaps there is a need to take a proper look at the whole area near the historic Parish Church, especially now that local residents have persuaded Fife Council to introduce a parking permit scheme. 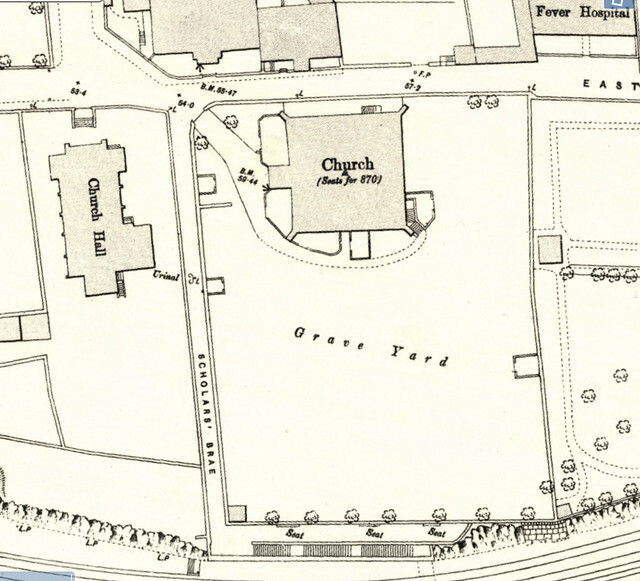 This would be an opportunity to add a new interpretation panel about the Parish Church, the King James Bible and the events that resulted in the Free Church being established on this site. Any improvement scheme might also take in Scholars’ Brae which has seen better days. This 1894 map shows three seats.